What is the abbreviation for Would Make A Good Name for A Rock Band? A: What does WMAGNFARB stand for? WMAGNFARB stands for "Would Make A Good Name for A Rock Band". A: How to abbreviate "Would Make A Good Name for A Rock Band"? "Would Make A Good Name for A Rock Band" can be abbreviated as WMAGNFARB. A: What is the meaning of WMAGNFARB abbreviation? 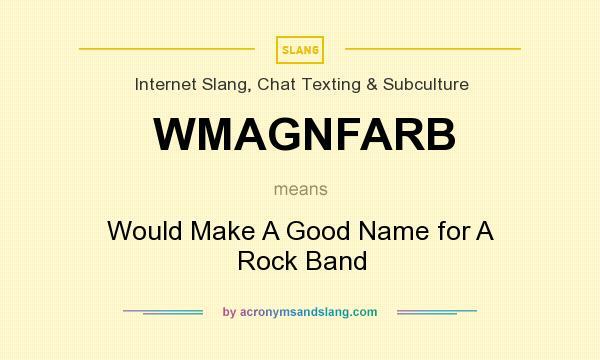 The meaning of WMAGNFARB abbreviation is "Would Make A Good Name for A Rock Band". A: What is WMAGNFARB abbreviation? One of the definitions of WMAGNFARB is "Would Make A Good Name for A Rock Band". A: What does WMAGNFARB mean? WMAGNFARB as abbreviation means "Would Make A Good Name for A Rock Band". A: What is shorthand of Would Make A Good Name for A Rock Band? The most common shorthand of "Would Make A Good Name for A Rock Band" is WMAGNFARB. Woop Woop - A fictitious name for any small out-of-place, unimportant town - "he lives somewhere out in the Woop Woop"